Gothic makeup can be as subtle or outrageous as you want. You don't need deathly pale skin. You don't need flawless features. Hell, you don't even need guidelines...but it's a good idea to follow them, just in case. Steal from others. 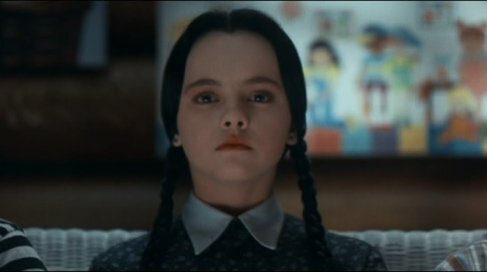 If you want to copy, say, Wednesday Addams, don't fret about being "original enough." A well-copied look is better than contrived originality. Look for inspiration. You don't have to limit yourself to just "gothic" movies, music and books. 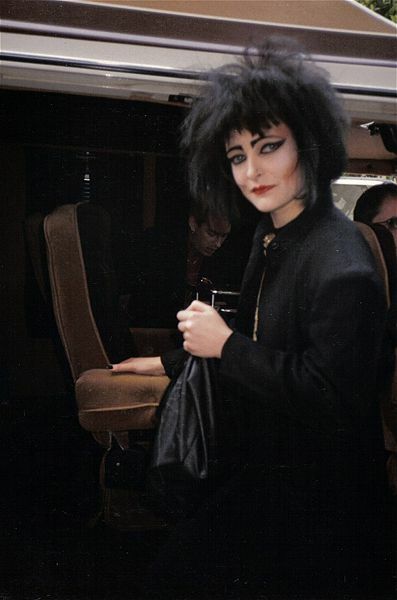 If you really like goth makeup, and your favorite t.v. show is Are You Being Served?, why not see if you can combine Mrs. Slocumb with Morticia Addams? You might scare the cat, but nobody will bother you on the subway. Highlight your best features. Fashion billboards might have you believing that you look like a cross between a goonie and a troll. Even if you do, you probably have some feature––a nice lipline, say, or pretty eyes––which can be highlighted. Ask a professional makeup artist if you're unsure. Pretend. What good is makeup if you can't pretend you're someone you're not? The adjective pretentious has come to describe, in recent years, a person who thinks better of him or herself than the accuser thinks of him or herself. In many cases, it's an expression of covert envy and hostility. "If only I had so much self-confidence..." the person is, often, really saying. Just ignore these people. Nothing useful or substantive ever comes from that attitude. Spackle your zits with foundation/concealer. This goes for pockmarks also. Nobody's skin is perfect, but trying to cover up these flaws will only draw attention to them. Try to change the color of your skin. Unless you're a makeup professional, it's Halloween, or you're going somewhere really, really dark, don't make your skin paler than it naturally is by more than two or three shades. You don't have to look like Morticia, you just have to look like you. Emphasize your lips, cheeks and eyes at the same time. You can sometimes get away with this, especially when you're going for a more theatrical look. But, as a rule of thumb, pick one area of your face to emphasize and stick with it. Be afraid to experiment. The worst thing that could possibly happen is that someone will mistake you for a convicted criminal, you'll be arrested, and the makeup is so resilient you can't rub it off in jail, resulting in your sentencing and conviction for a crime that you didn't commit. But you're probably more afraid that people will laugh at you. So what if they do? Who cares? Forget to wear sunscreen––and hats. Not only do these prevent skin cancer, they also keep your skin light. Smoke, unless you want to look really, really old. Look, if you're an adult, you're free to do what you want. But caveat emptor––smoker's face is not some mythological construct. Maybe you have good aging genes, maybe you don't––but smoking isn't going to help. You might look really cool with that clove cigarette at twenty. But what if you turn thirty-eight and realize you look fifty? 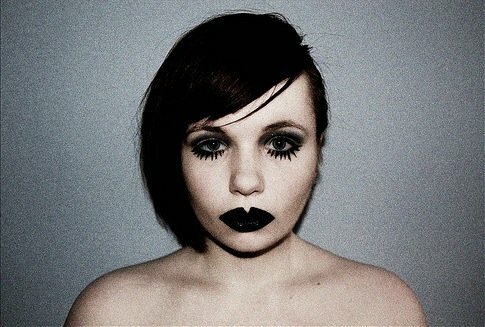 These makeup don't apply to gothic makeup as well as any form of makeup. Now that these are out of the way, here are a few gothic makeup looks which you can easily, and not-so-easily, duplicate at home. Drusilla: Do you love my insides? The parts you can’t see. Drusilla was a villain in the second season of Buffy the Vampire Slayer. She was also Spike's girlfriend (Spike being the blond guy with the cheekbones). She almost always dressed like a slightly gothic, Victorian waif––all long dresses in white, black and red with tight waists and scoop necklines––but her makeup was subtle, and did not really fit in with the gothic cliche. Drusilla is supposed to be insane, and sick, so the whole "vamp" look contrasts too sharply with her air of childlike evil and insanity. Instead, the makeup artist has her wear matte, light-pink lipstick. Her eye makeup is usually a light smokey gray, with some mascara and eyeliner, but not too much. The edges of her eyelids are darker than the middle of her eye, making her whole eye look bigger. In one shot of "What's My Line," Drusilla's seen with fingernails painted black, with white tips. Named after Wednesday Addams, eldest daughter of the Addams Family, this look is the most low-maintenance look on record. Basically, you only need a gray or black eyeshadow, a black eye pencil, powder slightly lighter than your skin, and coral-colored lipstick. If you look really bad in coral, a light red will do in a jiffy. But no pink! Apply the powder across your neck and face, and draw the lipstick inside your lipline. Smudge a tiiiny bit of eyeshadow along your outer lid. Draw your black eye pencil along your lower inner eyelids, if you want to. A dab of light greasepaint, applied to the outer corners of the eyes and blended into the skin, can make them look much bigger. 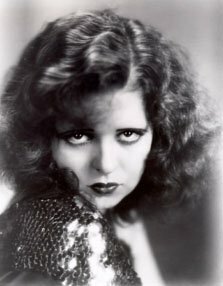 Clara Bow, siren of the silent screen, wore black lipstick. Much of her appeal came from how Max Factor, then a makeup artist to the stars, painted her face. Mr. Factor painted a "Cupid's Bow" over her lips, which went far outside her lipline but made her lips look smaller. Her eyes were also darkened by black eyeshadow, and she wore long "falsies," or false eyelashes. Applying black lipstick requires some finesse. If you're a beginner, emphasize your lips to the exclusion of all else. Dust on some dark grey and black eyeshadow, wear powder and foundation, but make everything else less dramatic. Anne Gwish: (on the phone) I just have to do my hair and make-up. I'll be ready in three hours. Traditional gothic makeup involves lots of white cream and powder, dramatically dark smokey eyes, blood-red lips and long, acrylic fingernails (unless you're a guitarist). This look has become cliche for a reason, and it's difficult to pull off well. But everything worth doing is difficult. If you're shy, this makeup gives you the perfect excuse not to talk to people. It's only gothic makeup taken to its logical conclusion; so why not try it?